We are very fond of Mercedes-Benz cars, and we have already drawn a lot of different models of this company. 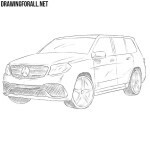 We have already drawn a C-Class and S-class, now it’s time to learn how to draw a Mercedes-Benz E-Class. 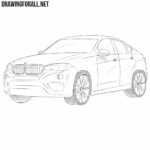 All our drawing lessons about cars start with the general outlines of the body, and this lesson will not be an exception. 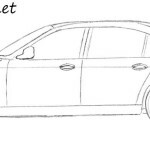 So with the help of very light lines sketch out the body of our E-Class, as shown in our example. Now let’s add the most basic details to the body surface to make our drawing look more like a car. In the front part we sketch out the grille and headlights. Next sketch out the outlines of the wheels and the rear-view mirrors. Starting with this step, we will draw out the details using clear and dark lines. Draw out the outlines of the radiator grille and the characteristic headlights of our Mercedes-Benz E-Class. Do not forget to draw lines inside the headlights. Continue adding details to the front of our Mercedes-Benz E-Class. Using the long and smooth lines, carefully draw the hood. Next, draw the outlines of the bumper. Draw the Mercedes logo and move to step number five. Continuing the hood lines draw out the contours of the smooth roof. In the same step, we need to draw out the outlines of windows and rear-view mirrors as in the example below. Continuing the line of windows draw out the doors of our Mercedes-Benz. Next continuing the line of the roof create the outlines of the back. Do not forget to draw handles and two longitudinal lines on the side of the body. Let’s move on to the wheels now. Carefully draw out the outlines of the wheels and wheel arches. You need to try to make the wheels and arches the as smooth as possible. And this is perhaps the most difficult step in the drawing tutorial about the Mercedes-Benz E-Class. Here we need to draw out the rims, which can be like in our example or any other form. The drawing of the car is almost complete, and in order to make it more realistic, we need to add some shadows. Draw shadows using hatching of different density, depending on the darkness of the shadows. Also do not forget to draw a texture of the radiator grille and glare on the surface of the body and windows. 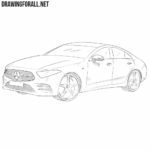 In this lesson we showed you how to draw a Mercedes-Benz E-Class. 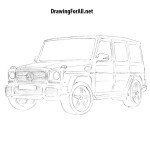 We are very fond of cars of Mercedes-Benz, and we plan to draw a lot of other models of this company. So be sure to subscribe to our social networks and visit our site as often as possible in order not to miss a single new drawing lesson.